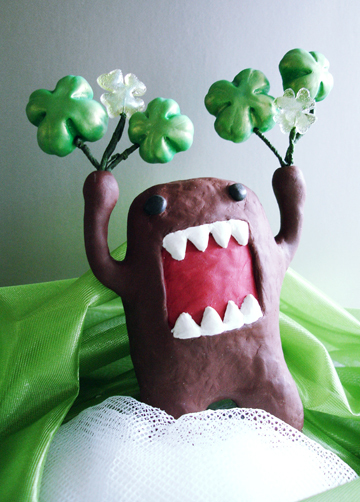 Domo’s back to celebrate St. Patrick’s Day! With the luck of the Irish he managed to fine handfuls of four leaf clovers! These particular fields of clover are a mix of sculpted polymer clay dusted with a light coat of metallic powder and smaller clovers that were cast resin mixed with a bit of green pigment and a dash of metallic powder.